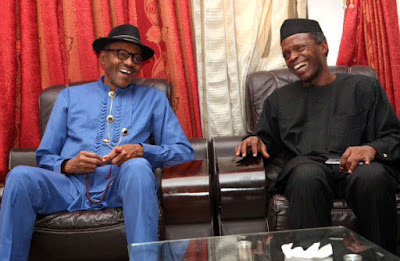 President Muhammadu Buhari and Vice-President Prof. Yemi Osinbajo, who are also the Presidential and Vice-Presidential Candidates of the All Progressives Congress (APC) in the forthcoming Presidential elections, will today, Wednesday, January 16, at 8pm (Nigerian time) participate in a live televised two-hour presidential town-hall programme. This was contained in a statement forwarded to DAILY POST by Festus Keyamo, the Director, Strategic Communications, APC Presidential Campaign Council. The event will hold at the Ladi Kwali Conference Center, Ballroom of Sheraton Hotel Abuja. Attendance is strictly by invitation and all guests are expected to be seated by 7pm. Part of the statement read: “The presidential series, which is titled “The Candidates”, is designed by the organizers to have both the Presidential and their Vice-Presidential Candidates of selected political parties on stage at the same time and at different dates to take questions from the moderator, Kadaria Ahmed and from the general public through various platforms. “The programme would be broadcast live on NTA, which shall, in turn, provide the live feeds to other partner stations like TVC, Wazobia TV, Oak TV and on all Radio Nigeria stations. It will also be streamed online at dtv.media to enable Nigerians in the diaspora to participate.